Well done to our student volunteer Molly Hale who won the Keynsham Rotary ‘Young Citizen of the Year’ Award for 2018/19. Molly was nominated for her volunteering and fundraising activities. A true inspiration to the young people of Keynsham. 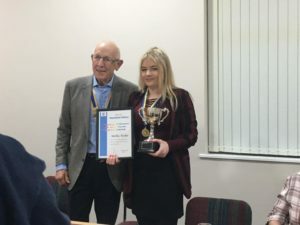 Molly attended the Keynsham Rotary meeting enjoyed a meal and accepted her award and told the members of the Rotary why she enjoys what she does. Well done Molly.